So, how did this “fab lab” and ” makerspace” movement begin? In 2009, MIT’s Center for Bits & Atoms launched their Fab Lab program and birthed the Fab Foundation. The purpose was “to facilitate and support the growth of the international fab lab network as well as the development of regional capacity-building organizations.” (See their mission statement at the end of this post). This sparked the birth of fab labs all over the world as people came together to make, create, and share their tools, knowledge, and resources. These labs fostered an open source environment of knowledge, templates, manuals, and instructions to fabricate objects or pieces meant to solve problems. People would iterate upon each other’s works and grow the pool of resources. This was the beginning of a network of Fab Labs all over the world. The Fab Foundation convenes and organizes the annual FAB Conference around the globe. This year in France, #FAB14France brought together members of 1,200+ labs around the world “to share, discuss, collaborate and create communities around the different local and global interests regarding digital manufacturing, innovation, and technology.” The conference had a structure comprised of five summits: FOOD, MOBILITY, MACHINES, MONEY and ACCESS. Since the beginning of the Fab Foundation in 2009, AS220 has been a shining star in this global network of fabrication labs and makerspaces. 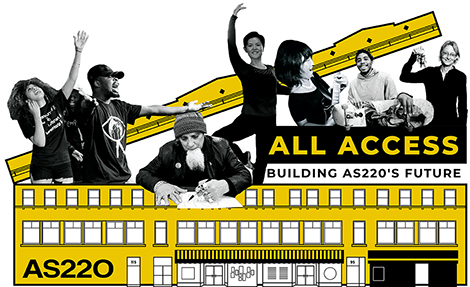 We are acknowledged as an arts non profit that runs a successful, community-centered fabrication lab as part of our AS220 Industries program. Through volunteer and member-driven support, the AS220 Industries have grown to become a multidisciplinary program that encompasses a Printshop, a Fabrication Lab, a Darkroom, and a Media Arts Lab; with a green screen, classroom space, various printmaking stations, laser cutters, a CNC router, a large scale etching press, and a podcast/recording room, among other facilities. FIND OUT MORE HERE. 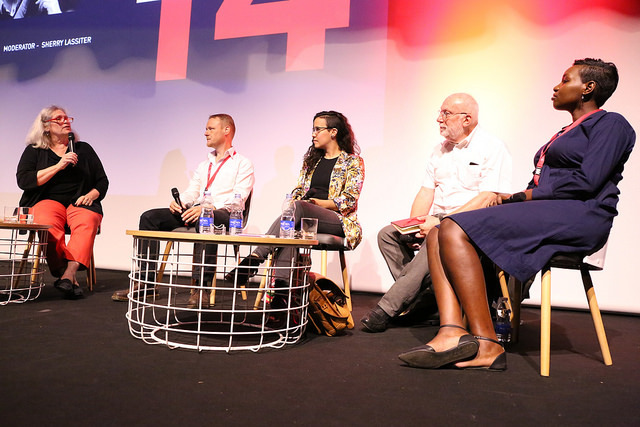 This year, AS220’s Artistic Director Shey Rivera was invited to be one of the keynote speakers for the summit on ACCESS at the #FAB14France conference. 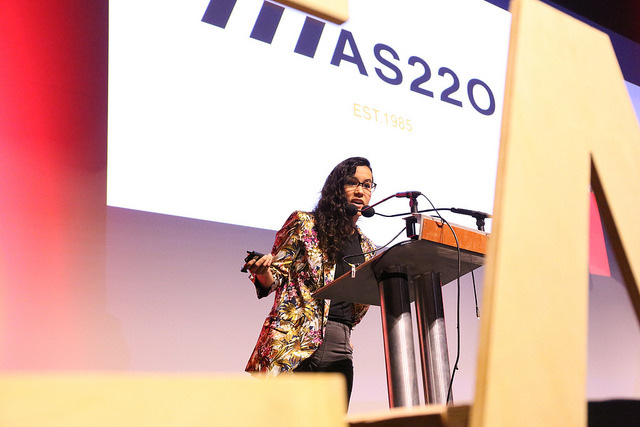 Rivera presented on how AS220 nurtures creative communities of artists, how we partner with the City of Providence and other government entities in support of creative entrepreneurship, and how we’ve become a renowned model for socially responsible urban and community development. We, the people of Rhode Island, associate ourselves for the purpose of providing a local forum and home for the arts, through the maintenance of residential and work studios, galleries, performance and educational spaces. Exhibitions and performances in the forum will be unjuried, uncensored and open to the general public. Our facilities and services are made available to all artists who need a place to exhibit, perform, or create their original artwork, especially those who cannot obtain space to exhibit or perform from traditional sources because of financial or other limitations. 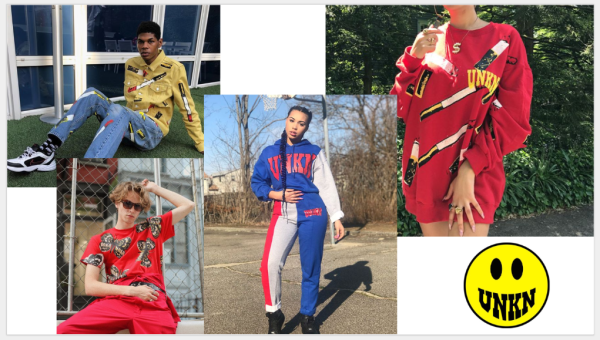 Here’s the link to the FAB14France: ACCESS symposium conversation facilitated by Sherry Lassiter, Fab Foundation’s President and CEO. 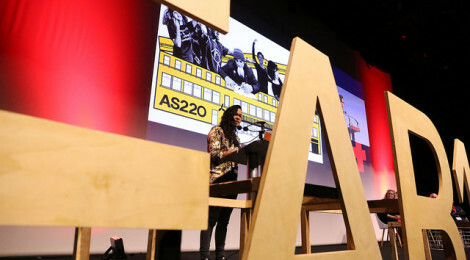 At this global forum, Rivera presented the work of some of the brilliant artists and creative entrepreneurs that make and create within AS220’s programs. And FAB14France provided an opportunity to reunite with some of our international Fab Academy alumni, Romain Di Vozzo (France), Kenzo Abiko (Brazil), and Lorenzo Negri (Italy). As well as Konstantin Leonenko former Director of the IZO Lab in Kyiv, Ukraine, with whom AS220 launched “Museums Connect: Confronting Violence Through Youth-oriented Media” (aka Brighter Worlds), an exchange program in 2016. AS220 is proud of being part of a global artist network! 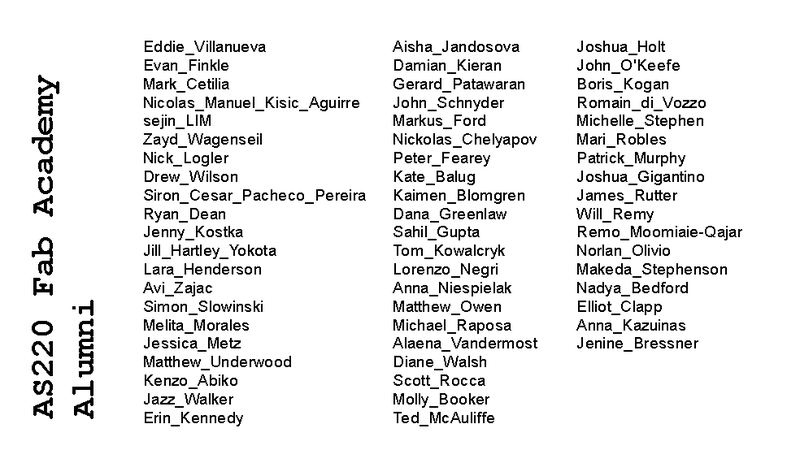 A big THANK YOU to Romain Di Vozzo, Sherry Lassiter, Neil Gershelfeld, and the Fab Foundation! Check out some of the brilliant artists and amazing work being created at the AS220 Industries! Everything from apparel, fine art prints, books, electronics, music apps, games, sculptures, signage, and more! Become a member HERE. 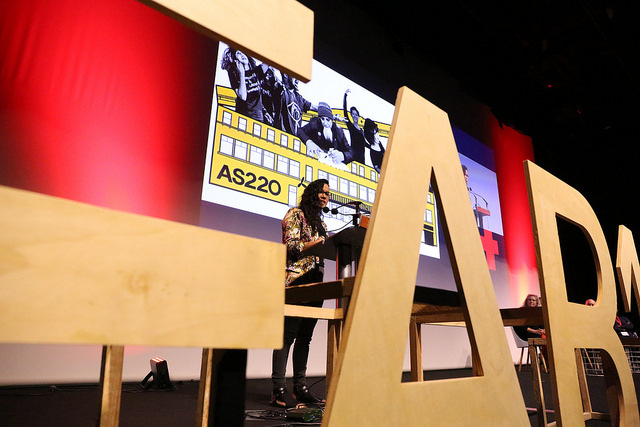 AS220 Founder Umberto Crenca was a keynote speaker at FAB10Barcelona in 2014! Bert was also recognized by the U.S. White House as a “Champions of Change” in 2016 in representation of the maker movement. Also, the brilliant educator and machinist Anna Kaziunas France was the former AS220 Fab Academy instructor. She was heavily involved in the Fab Foundation and the global maker movement as an educator, designer, and she also produced/wrote manuals for 3D printers and lasercutters, among other machines! Kaziunas was part of FAB9Japan in 2013. Check out her TEDxVilnius (Lithuania) “The Art of Making Mentors”. And a s/o to the founder of the AS220 Fab Lab, Shawn Wallace, who was also the first Managing Director at AS220, taught the Fab Academy program for many years, and has long been involved with the Fab Foundation. Wallace is the founder of FLUXLY. What is AS220 doing about ACCESS?? Find out about our ALL ACCESS campaign goals HERE! The Fab Foundation was formed in 2009 to facilitate and support the growth of the international fab lab network as well as the development of regional capacity-building organizations. The Fab Foundation is a US non-profit 501(c) 3 organization that emerged from MIT’s Center for Bits & Atoms Fab Lab Program. Our mission is to provide access to the tools, the knowledge and the financial means to educate, innovate and invent using technology and digital fabrication to allow anyone to make (almost) anything, and thereby creating opportunities to improve lives and livelihoods around the world. Community organizations, educational institutions and non-profit concerns are our primary beneficiaries. The Fab Foundation’s programs focus on: education (.edu), organizational capacity building and services (.org), and business opportunity (.com). ← Print Lottery opening reception this Friday!